I liked the book (another young adult tearjerker after TFIOS), so I am looking forward to watching this. My book review can be read here. Hmm. It’s feeling too much like the Divergent franchise. And where did Jonas’ lovelife come from? I don’t remember it from the book. Oh well. Let’s see. Ever wondered why this evil queen just has to have iconic horns, a powerful staff, and a crow for a sidekick? What is the deeper reason why she gatecrashed the kingdom’s party that made her curse the princess out of the blue? The Disney classic really doesn’t make sense on what to make of her existence other than as a juxtaposition of pure malice and evil with innocence and good, but Disney made up for it in this live-action film in presenting the back story of the queen. You can almost expect that origin stories of female villains will always establish how they were once good, driven mad by society and scarred by male lovers. Hell hath no fury like a woman scorned is very much applicable to Maleficent. Angelina Jolie embodied her brilliantly. 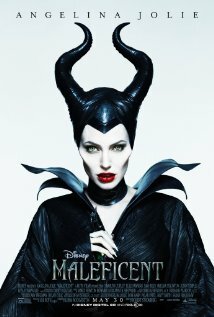 Her already prominent cheekbones were even emphasized with prosthetics, and her imitation of Maleficent’s lazy drawl was spot on! Her sarcasm and wit has a huge spectrum as a character, her malevolence making her the scariest Disney villain-ess ever (Ursula doesn’t compare). I loved how they cast her daughter, Vivienne, as the toddler Aurora who was unafraid of her menacing costume (so cute), and it’s amusing how references to the Disney classic were spread throughout the movie. An easter egg would be the lopsided birthday cake made by the three fairy godmothers. I won’t say any more so as not to spoil, but I am pretty satisfied at the reasons why she came to be despite complaints of its lack of gravitas. Come on, folks. It’s a fairy tale of a fairy tale character. The best thing that Disney did was bring out her humanity despite her bitterness, and that kudos for the growing consistency of these recent films in shattering the romantic notion of true love. I was mortified, I was thrilled, I was moved by her narrative. To hell with princess and prince love stories, haha. More female villain feature films, please!